we love fun breakfasts on weekend mornings, but sometimes we need a break from all of the pancakes and waffles that we make. 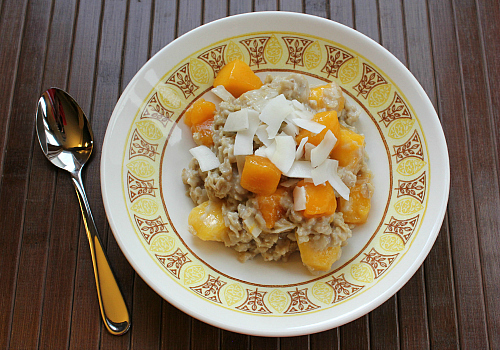 the other morning, i was in the mood for something tropical for breakfast, so i got the idea of making a tropical-style oatmeal. 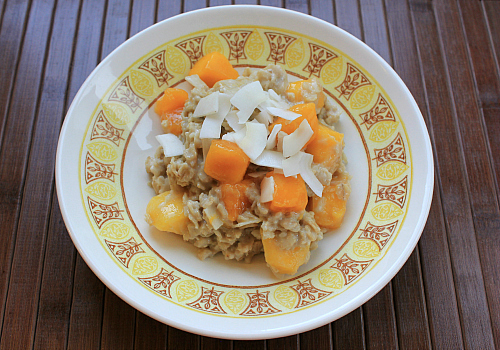 i made a batch of oatmeal and mixed in some honey, diced mango, and roasted coconut chips. instead of regular milk, i made the oatmeal with almond milk. so, it was dairy free and vegan! 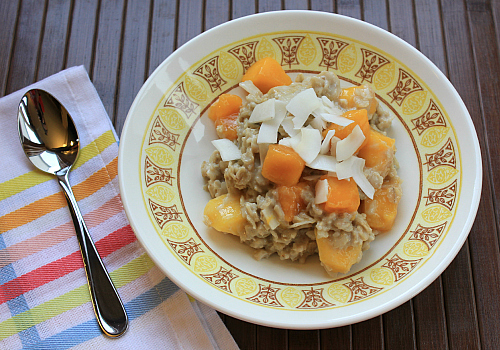 the coconut mango oatmeal was so good, we absolutely loved it. it had such a great flavor, and just a little bit of sweetness. it was super easy to make and only took a few minutes. a perfect breakfast for a dreary cold morning. bring the almond milk to a boil in a sauce pan. stir in the oats and reduce the heat to medium. cook for 5 minutes, until the oats have absorbed the almond milk. remove from the heat and stir in the honey, coconut, and mango. let sit for 2 minutes, until the coconut chips have softened. serve warm. the roasted coconut chips are unsweetened. if you substitute sweetened shredded coconut for the roasted coconut chips, simply omit the honey, otherwise the oatmeal will be overly sweet. That looks good. I always put bananas on my oatmeal, that is something different for a change.